I can’t even begin to tell you how often I am sticking my foot in my mouth. The wrong thing always seems to pop out unintentionally. If I’m angry, it’s even worse. That filter that some people have between their brain and their mouths was left out when I was manufactured… or so I thought… The truth is that I have a problem with thinking before I speak and using self control. 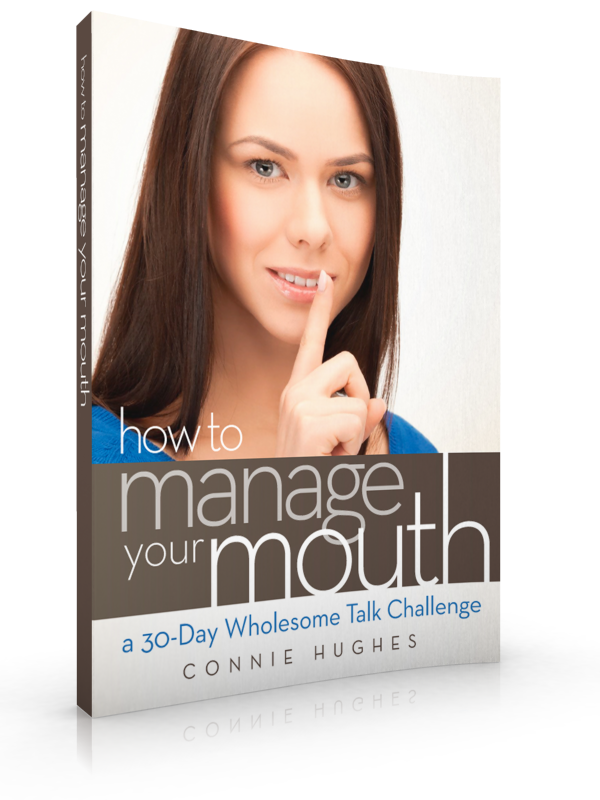 When Connie Hughes of Smockity Frocks offered for bloggers to review her book, How to Manage Your Mouth – A 30 Day Wholesome Talk Challenge my first thought was “Okay, I desperately need to read that.” My second thought was “But I’m not going to like what I find out about myself when I read this…” I finally told my flesh to shut up and sent an email to Connie Hughes asking if I could please review the book. In How To Manage Your Mouth, Connie gives us a look into her heart and why she wrote this daily devotional with journal prompts. Each day has a scripture to apply to our lives and a short but powerful read about why and how to put it into action. There was never a day that was dry, dull, or unuseful. Every day I read, wrote, and did a lot of searching in my heart. I received the book on a Sunday and began reading it on Monday. Unfortunately, on Tuesday night I was admitted to the hospital with a dangerous blood clot. Several times I tried to begin reading the book again, but due to illness I was just not able to keep up. It wasn’t until I had caught myself saying something that I knew I was going to regret that I decided enough was enough and started all over. A week after starting How to Manage Your Mouth – A 30 Day Wholesome Talk Challenge the final time, I found myself in a situation that I often find myself in: Arguing with my ex-husband on co-parenting issues with our two children. Right away I fell back into old habits. I was snipping right back at him with sarcastic insults whenever I felt that he was insulting me. Suddenly I remembered the scripture I had read that morning and realized that when held over a fire, I quickly failed the challenge. I stopped the conversation right there and did something that was extremely hard for me to do. I asked the father of my two oldest children to forgive me for my behavior. Yeah, that was NOT easy. The rest of the conversation went on with him and I discussing ways that we can work together to be better parents to our children. Since that day I have had moments where I have slipped, but in all honesty this book has changed my speech. When I am about to say something that is negative (or I have just said something that I regret) I remember the scriptures compiled in this study and bring myself into accountability. in Kindle format for $3.99. Don’t have a Kindle? That’s okay. You can download an app for your computer, phone, or tablet for free and read it that way. Click here to read more about free Kindle apps.